Sector Leadership Group members are elected or appointed to represent the wider voluntary, community and social enterprise sector. Together they have a broad range of expertise and many years' experience working in and with the sector. Find out more about them and how to get in touch below. Judith Bell is Operations Manager for Healthwatch Norfolk, an independent organisation that uses people’s views and experiences to help inform and improve the services that are commissioned and provided in Norfolk. Judith’s 15 years of experience working in the voluntary sector, including her previous roles as CEO of Yare Valley CAB, Operations Manager of Norfolk CAB, and Service Director of Norfolk Family Mediation Service, means she is familiar with a wide range of issues within the VCSE sector. Laura Bloomfield is Head of Operations and Service for Future Projects, a charity that addresses hardship and deprivation across Norfolk through the delivery of 3 core services. Future Education: Independent Special school which provides education to 14-16 year old children with Behavioural, Emotional and Social Difficulties and/or special educational needs. The school is Ofsted registered and works specifically with children excluded from other education provision. Future Radio 107.8fm: Ofcom registered community radio station with a broadcast reach of 190,000 across Norwich. Future Radio provides broadcast and media training, hard and soft skills development, confidence building and employability skills and volunteering opportunities to hundreds of individuals. Future Support: Community based support service which delivers one-to-one and group based support programmes, information advice and guidance. Baseline provides early interventions in areas such as health, housing, budgeting, welfare rights, criminal justice and employment, as well as confidence building and wellbeing activities in the community. Laura has spent 20 years working across a range of disciplines in both statutory Children’s Services and the VCSE sector. With a background in Social Pedagogy she is passionate about coproduction and empowering individuals to have a voice and shape services to meet their needs. Jon is Chief Executive of Community Action Norfolk, a county-wide membership organisation whose aim is to build a stronger, fairer Norfolk through working with voluntary, community and social enterprise organisations as well as public and private sector partners. As one of the ‘Working Together’ partners, Jon provides a link between the VCSE sector and Norfolk County Council to improve engagement, support and working together to achieve better outcomes for the communities and residents of Norfolk, particularly smaller and rural community groups. 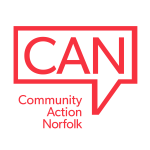 Community Action Norfolk formed in April 2015 following the merger of West Norfolk VCA with Norfolk RCC, where Jon had been previously been the Chief Executive. Jon has a background in economic development with a focus on local economies, and has a particular interest in rural issues and community development. The work that he does at Community Action Norfolk ranges from working with communities and community groups on grassroots needs to working with partners on high-level strategic issues. Graham is vice-chair of Norfolk Older People’s Strategic Partnership Board, which brings together different agencies to ensure that older people in Norfolk can lead independent and fulfilling lives. Graham brings the perspectives of older people and groups working with them to the Sector Leadership Group. Graham had an extensive career in broadcast journalism with the BBC and ITV, working in news and political programming as well as producing and directing a wide range of documentaries. He was Managing Director of Anglia Television for ten years, latterly combining this with his role as Director of Regional Programming for the ITV Network. Graham was awarded the OBE for services to Broadcasting in 2006 and is now Pro Chancellor of Norwich University of the Arts and a visiting professor in Media. Graham previously chaired the City of Norwich local strategic partnership and acted as Sheriff of Norwich as well as spending many years as deputy chair of Norfolk and Suffolk NHS Foundation Trust. Cindee is Chief Executive of Momentum, a membership based charity that provides infrastructure support to those working with children and young people, within the voluntary and community sector in Norfolk. Momentum provides the Voluntary Sector Forum (children, young people and families) which is the key mechanism, along with Cindee’s attendance at key strategic children’s services partnership meetings, for engagement between the statutory sector and the VCSE sector working with children and young people. As one of the “Working Together” partners, Cindee provides a link to the Sector Leadership Group, to ensure that the children’s agenda is not lost. Cindee believes that she has an important role to play in helping to “join up the dots” and to share information that will lead to improved partnership between the sectors, as well as highlighting where there are issues that unfairly impact on our sector or hinder our sector from achieving the best possible outcomes to our service users. Claire is Chief Executive Officer of Norfolk Community Foundation which is part of a worldwide charitable network and one of 46 Community Foundations within the UK. The Community Foundations work together to share learning and provide a structure for government, grant funders and organisations wanting to have an impact across the UK. The Community Foundation is a trusted and expert advisor on giving, philanthropy and funding that makes a difference across Norfolk. Alan is Chief Executive of Voluntary Norfolk, a county-wide membership organisation which promotes, supports and develops volunteering and the work of voluntary organisations, aiming to encourage recognition and understanding of the value of the sector in the achievement of individual well-being and an inclusive and fair society. As one of the ‘Working Together’ partners, Alan provides a link between the VCSE sector and Norfolk County Council to improve engagement, support and working together to achieve better outcomes for the communities and residents of Norfolk. Voluntary Norfolk will celebrate its 50th anniversary in 2019 and continues to provide infrastructure support and services via Charity Backroom and membership to hundreds of voluntary organisations throughout Norfolk. Alan has both a commercial and a voluntary sector background, working for YHA and Addaction before joining Voluntary Norfolk in 2016. A background that includes being a volunteer for a children’s disability charity for over 25 years. Paul is Chief Executive of The Matthew Project, a charity helping people prevent and recover from a range of issues such as alcohol, drug, mental health, loneliness, health, wellbeing, unemployment and family matters. They reach and support a wide range of people including children, young people, families, the armed forces and older people across all of Norfolk. Paul is a member of various forums including The Homelessness Forum, Mental Health Forum and Young Peoples Forum keeping him in touch and involved in a wide range of new projects, strategies and joint working. Previously Paul has worked for international companies and charities, for the UK public sector in roles ranging from Environmental Health, Public Health, Regeneration, Community Safety and Crime to Fundraising, Strategic Leadership and Partnership Development. Paul provides an important link to substance misuse and complex needs and as well as a wide range of other issues. Ed Maxfield is the Chief Executive of Musical Keys, a charity which provides music and arts activities for people with disabilities and additional needs in Norfolk and the surrounding area. Ed joined Musical Keys in April 2018 after a career in management, communications and public affairs. He first moved to Norfolk at the age of 18 and has worked in the public, private and voluntary sector in locations around the UK and Europe. Dan is Chief Executive of MAP a charity for young people, providing advice, counselling and youth work as well as education and training for young people, and their parents and carers. He is the chair of Norfolk Community Advice Network, which has appointed him to represent information and advice providers at the Sector Leadership Group. Dan is also one of the current VCSE representatives to the Norfolk Health and Wellbeing Board. Dan has spent his career working for charities focusing on mental health, substance misuse and homelessness so has worked alongside the NHS and local authorities. He has worked in a number of roles to promote the VCSE including training commissioners and co-authoring a VCS commissioning guide. His priority is to ensure there is a positive relationship of equal partners with the VCSE and public sector and that whenever the VCSE is best placed to deliver services because of their skills and values they are given the opportunity. Mette Ohrvik is Chief Executive of the Sue Lambert Trust, a charity which provides support and counselling to people who have been affected by sexual and/or domestic abuse. Previously Mette worked in social housing for 21 years, starting out as a housing officer in London, and finally as Head of Strategic Housing Services in North Norfolk. Her role as CEO at Sue Lambert Trust is her first 3rd sector role and during the 7 years she has been there the organisation has increased its operation threefold in response to a huge increase in demand from adults who were sexually abused as children. She is involved in a number of forums related to mental health and victims services including the Norfolk Domestic and Sexual Violence Board and the Childhood Sexual Abuse sub-group of the Norfolk Childrens Safeguarding Board. She is Vice Chair of the Mental Health Providers Forum and has been nominated by them to represent mental health providers on the SLG. She is very keen to support a positive dialogue between all service providers, strategic planning bodies and commissioners. Ben is Chief Executive Officer of Equal Lives, a membership based organisation with over 50 user-led member groups and over 600 individual members, aims to unite the voices of people who face disabling barriers and work to enable them to live barrier free, independent and Equal Lives. Tim is Chief Executive of YMCA Norfolk, a charity which works with disadvantaged young people and families at a point of crisis in their lives, including those who have been affected by homelessness. Tim is also chair of the Voluntary Sector Forum (Children & Young People), which appointed him to bring the perspectives of those working with children, young people and families to the Sector Leadership Group. Tim first joined the YMCA as a support worker back in 1999 and has worked for the organisation in different parts of the country. He has been Chief Executive at YMCA Norfolk since 2009. Elected chair of the Voluntary Sector Forum in 2014, he has focused on making it more closely connected to members and ensuring that organisations both large and small have a strong voice within the forum. Daniel is the Director of yournorfolk Ltd., a management consultancy service for the VCSE sector in Norfolk. Daniel is an elected member of the Sector Leadership Group and has worked within the VCSE sector in Norfolk for over 20 years. He worked in housing before moving to the Prince's Trust, where he became the manager for all aspects of Prince's Trust operations across Norfolk. In 2006 Daniel joined the Big C cancer charity as Chief Executive, increasing the commercial profile of the organisation and generating long-term, sustainable revenue funds during his nine year tenure. Daniel believes this is a challenging but exciting time for the VCSE community in Norfolk. With the integration of statutory health and social care providers gathering pace there is an opportunity for our sector to work more effectively as part of a whole health and social care system. We know that the work of many VCSE providers will improve independence and build resilience across those who may otherwise be accessing community or acute healthcare services and a more fully integrated commissioning process could tap into this resource. Elly is the Project Portfolio Manager and Deputy Director at Creative Arts East. She joined the charity in 2009 and has been involved across all areas of the charity’s work during the last nine years. Creative Arts East focuses on engaging those communities or its members who face geographical, physical or other barriers to participating in the cultural life of their area, using high quality arts and culture to make a positive difference to individual and community life. Their Vision: Culturally vibrant, connected and motivated rural communities. Their Mission: To improve community life through the creative use of the arts. Elly also sits on the Norfolk Arts Forum Executive Committee, StartEast Steering group and the Norfolk Culture and Wellbeing group. She will act as a link between the creative and cultural sector of Norfolk and the Sector Leadership Group, ensuring the sector has a voice within these fora. The group maintains a register of members interests in line with the Conflict of Interest Policy, both of which are published below. The secretariat for the group is provided by Community Action Norfolk.